RICHMOND, B.C.—New Democrat Adrian Dix’s positive vibrations election campaign turned decidedly snarly Tuesday as he was forced to grit his teeth while facing difficult questions about communists and the Chinese head tax. Dix had a simple answer for each of the probing concerns lobbed his way in crowded and heated campaign stops in heavily Chinese areas in Richmond and Vancouver: blame the Liberals—but in a respectful way. At one point in Richmond, Dix walked away from a scrum in mid-sentence, saying his Richmond Centre candidate Frank Huang came to Canada to find and build a new life and he doesn’t need the disrespectful Liberals dredging up his past as a Chinese Communist party member. Huang, who has won a B.C. journalism award for his coverage of one of Prime Minister Stephen Harper’s trips to China, said he was a Chinese Communist before immigrating to Canada in 2000, but said everybody in China who gets involved in politics is forced to be a Communist. He later confirmed that on the same day last February that he was asked to seek a nomination for the NDP in the May 14 election, the Liberals also approached him to run for them, but he chose the NDP after discussions with his family. Dix’s testy side has started to show itself in recent days as the campaign enters its final week with the NDP’s front-runner status wobbling and Liberal Leader Christy Clark gaining ground on the strength of her personal appeal and push to make the economy and the NDP’s past failures on the economic front the campaign’s central issue. Dix, who has been limiting his news conferences to one per day, held three scrums with reporters Tuesday, one in Sidney on Vancouver Island, and two others in Richmond and Chinatown. Huang said he quit the Chinese communist party before coming to Canada. Clark has attempted to discount Dix’s claims to run a positive campaign by framing his position on natural resources as negative. “I love the NDP’s positive campaign here,” said Clark. “How many times did Adrian Dix say he was going to run a positive campaign, and this is how they show it. In northern B.C., Clark made a stop where she again made the case for liquefied natural gas (LNG) development as the solution that would lift the province out of debt. As part of a campaign that has largely been characterized by visits to job sites, Clark wasted no time in reminding reporters after the tour of Spectra Energy that the LNG industry could generate 100,000 jobs and $100 billion in revenue over the next three decades. “(NDP leader) Adrian Dix will tell you this is a fairytale, but if you want to know if it’s real, why don’t you ask the 164 employees who work here full time, or the hundreds more who are hired for ongoing maintenance activity?” she said. She repeated a similar refrain in Kitimat where LNG could one day be shipped off to markets in Asia. Dix has spent the last week emphasizing that his party is one that not only says yes to LNG, but to other sectors such as mining, forestry, tourism, and film and television as well. 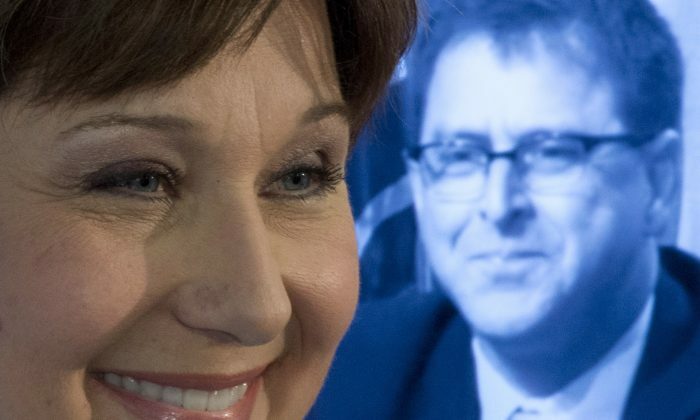 Despite that, Clark maintained that Dix’s “go-slow” attitude towards resource development, and his proposal to expand the carbon tax on oil and gas emissions, would sink the LNG industry.